July 22, 2017 "Information Clearing House" - This week some devastating news befell John Sidney McCain III. The other piece of US legislation currently on the table which Republicans are desperate to pass is the $1-trillion US infrastructure spending package. Juxtapose that scene next to the systematic destruction of Syria’s infrastructure by US Coalition and Israeli airstrikes and destruction by proxy militant forces on the ground. Estimates for the cost to Syria range from $180 billion to $275 billion. If the conflict continues past 2020, then these numbers could easily double. 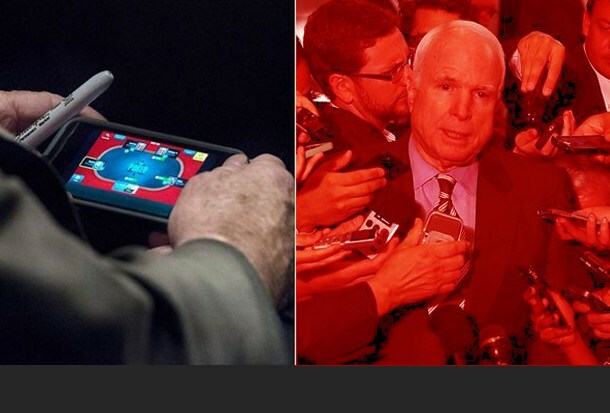 His has a very dodgy track record; whether it’s NeoNazis, or Jihadi Terrorists, McCain seems always ready to do a deal with the devil, and that’s what makes him particularly dangerous. It’s fair to say that while this Senator is being treated in the world’s leading medical facilities, thousands of innocents will have died needlessly because of US sanctions and support for terrorists – all [supposedly] in the name of defense, energy and ever vast corporate profits. Strange as that might sound to some, for those who consider themselves members of a ruling elite and its mandarin management class, that is perfectly acceptable quid pro quo in 2017.